The first solo Van Morrison album is a strange, short affair and one, I suspect, that Morrison has long since disowned. It was released without his consent, so, for many people, his solo career began with "Astral Weeks", the following year. Whatever its derivation, it is actually, I find, a surprisingly good listen. The sound quality is superb, almost a revelation, and you can hear the seeds of "Astral Weeks" being sown here and there across the album. The cover is pretty awful though. A lot of the material is very reminiscent of the work he did with Them, particularly "He Ain't Give You None", which has that blues guitar, swirling Dylanesque organ and crystal clear cymbal sound that Them utilised a lot, almost like Dylan's "Blonde On Blonde" "wild mercury sound". This is great track, actually, "I got messed up in a place called Notting Hill Gate..." Van tells us, as he evokes "backstreet jelly roll" for the first time. For 1967, this is a great slice of bluesy rock. Obviously influenced by Dylan, but impressive all the same. 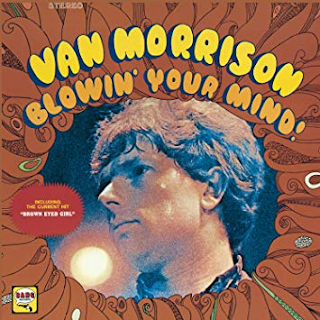 "Brown Eyed Girl" had kicked off the album before that and it just stands alone as a great single, totally incongruous in the Morrison canon, of course, but none the less wonderful for it. "T.B. Sheets" is a menacing, morose song concerning a premature death. It rumbles industrially on for around nine minutes in a bassy, bluesy Stones-influenced way, but is very effective and very disturbing in places. "I can almost smell your T.B. sheets on your sickbed.." is not something you want to listen to for pleasure very often. Written by one so young, it is a shocking and mortally aware song. In many ways, though, it is one of the best sixties-style blues he had recorded, though. It is actually quite remarkable. "Spanish Rose" has a jaunty, Sandie Shaw-type melody, some Spanish guitar and a Latin-ish finger-popping rhythm. "Goodbye Baby (Baby Goodbye)" is very Rolling Stones, circa 1965-1966 influenced piece of blues pop with some impressive guitar parts. The tracks on this album have mid sixties Dylan and Rolling Stones all over them. "Ro Ro Rosey" is a pumping, upbeat (again Stonesy) sort of "Brown Eyed Girl" meets "Gloria". It is another one that has many echoes of Them about it. Indeed, if you did not know, you would say it was Them. "Who Drove The Red Sports Car" is a wonderful slice of early Morrison bassy, slow grinding blues. 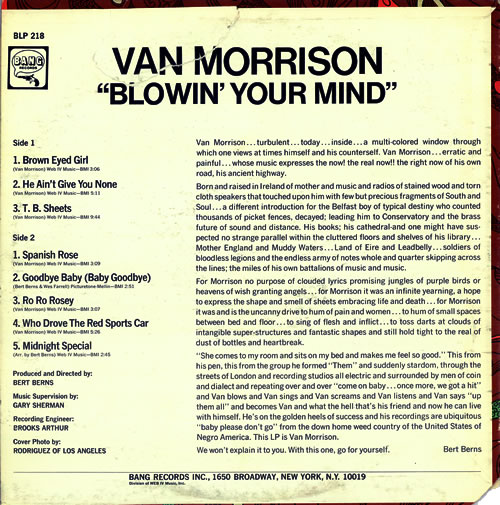 Morrison is particularly impressive on the "ad hoc" vocal improvisation at the end. 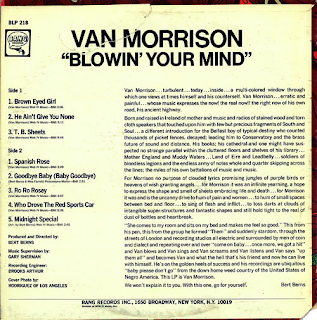 The album ends with a harmonica-drenched cover of "Midnight Special". Every now and again, Morrison plays this live, or on Jools Holland's show. It is played rockingly here, with some razor-sharp guitar. You know, I have been pleasantly surprised digging this album out again.